Rich Cotovsky is a lifelong Chicagoan, growing up and currently living in the Rogers Park neighborhood. He was a founding member of Mary-Arrchie – an amalgamation of parent’s names from one of his early acting students – and has served as its Artistic Director since it began in 1986. 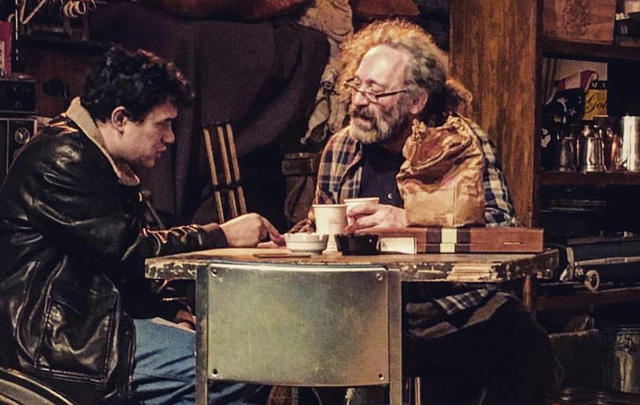 His award-winning theatre company has served up gritty and memorable productions for 30 years, but “American Buffalo” will be their final show. The building that houses the space the company has had since the late 1980s, the Angel Island theatre at the Broadway/Sheridan intersection, is slated to be torn down later this year. After 30 years and over 100 productions, Rich Cotovsky knew it was time to move on. In the first of a two part interview, HollywoodChicago.com talked specifically with Rich about the final production, “American Buffalo,” and how it actually inspired him when he was just starting out. HollywoodChicago.com: ‘American Buffalo’ is cited in your bio as a play that inspired you as an actor when you were first exposed to it in your early career. What aesthetic from that inspiration are you taking into your portrayal of the character of Don? Richard Cotovsky: When I saw it in my early acting days it was part of an introduction to theater. And the thing I loved about it first was the character of Teach. [laughs] As for the play itself, it is unbridled visceral energy. As it turns out, it was the language that struck me as we were preparing the play. The language is what moves it. HollywoodChicago.com: One of the themes of American Buffalo is the pursuit of value and status in a society that leaves many people behind. How do you relate to that idea in what you have pursued in own life? Cotovsky: I would say it’s more about getting respect, and being respected. Everyone is hustling to get there, and get their two cents in, but are their ideas really well respected? Is there stance in society respected? Respect comes out of living the right way, but it doesn’t always work out that way. People with money, power, they tend to get ‘respect,’ but the the real concept of respect is from people who are truthful and sincere about what’s going on. HollywoodChicago.com: What is different about Don than any other character you’ve ever done, and what element of yourself do you need to emphasize more to make the character more truthful? Cotovsky: I think Don is a very vulnerable character. He’s a guy who wants to do the right thing, and he’s trying to do the right thing, but he’s constantly being taken advantage of. His whole trip is to do things right and get things straight, but the people around him are vultures. HollywoodChicago.com: You are a lifelong resident, growing up and living in the Rogers Park neighborhood in Chicago. What defines ‘being a Chicagoan’ to you, and what is your opinion on gentrification of the neighborhoods, since it directly affected the fate of Angel Island? Cotovsky: Growing up in Chicago has a certain feel to it. You feel like your in command when you live in a neighborhood for a long time, you feel like you know what’s going on, and you learn to deal with the ‘infiltrators’ that invade your turf. Neighborhoods are constantly changing, mine is totally different from when I was growing up. We prided ourselves on surviving that childhood, because when you grow up in the city we were on our own very early. When I got older, I became familiar with the entire city. I’ve worked on the South and West sides, and lived all over the North side. I braved neighborhoods that I was always warned were terrible, and then watched them gentrify. As far as development being ‘unfair,’ I don’t feel that way. We got thirty years at our theatre location, and that was a good run. CLICK HERE for Part Two of the Richard Cotovsky interview, where he talks about the “Abbie Hoffman Died for Our Sins” Annual Theater Festival, and various production acts. Mary-Arrchie Theatre Co. Presents Their Final Production, “American Buffalo” Thursday through Sunday from January 28th through March 6th, 2016, at Angel Island Theatre, 735 West Sheridan in Chicago. For more information, including purchasing tickets, click here. Written by David Mamet. Directed by Carlo Lorenzo Garcia.